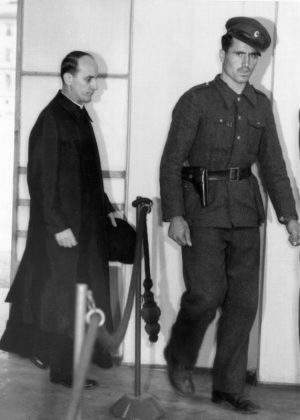 VATICAN CITY (CNS) — A commission of Croatian and Serbian experts studying Blessed Alojzije Stepinac’s life said they were unable to reach a conclusion on questions regarding the controversial martyr’s history. “In the case of Cardinal Stepinac, the prevalent interpretations given by Catholic Croats and Orthodox Serbs remain divergent,” said a message written by the commission and released by the Vatican July 13. While Cardinal Stepinac remains a national hero for Croats, he is still considered a highly controversial figure for Serbian Orthodox and some Jewish groups, who have accused him of being a Nazi sympathizer. The commission, which held its sixth and final meeting July 12-13, is made up of representatives of the Serbian Orthodox Church, the Catholic Church in Croatia and the Vatican. It was created at the request of Pope Francis. Before World War II, Blessed Stepinac was noted for helping Jewish refugees from Nazi Germany. Though he welcomed the independent, pro-Nazi Croatian state declared in 1941, he later protested the puppet regime’s genocidal policies and atrocities committed against Serbs, Jews and Gypsies. But when communist partisans came to power in 1945, they accused the cardinal of attacking communism, and he was convicted of collaborating with the Nazis. He died under house arrest in 1960 from an illness he contracted in prison. Blessed Stepinac was beatified as a martyr by St. John Paul II in 1998. Croats see him as a symbol of the church’s resistance to communist oppression, but others sharply criticize his early support of Croatia’s pro-Nazi government. “The study of Cardinal Stepinac’s life has taught that, throughout history, all churches cruelly suffered different persecutions and have their martyrs and confessors of the faith,” the commission said. Blessed Stepinac – Pray for us.